I’ve had three or four looks at O’Tauto’s win in a 3YO BM70 at Flemington on Saturday - his second win in just four starts with a couple of seconds thrown in so a consistency pattern is already emerging. He’s a big fella of close to 16.2 hands, and very clearly likes to find his feet. He actually travelled hard on the bit in the early stages, but by the time they got to the 800 metres he’d dropped the bit completely. Damien Oliver had to “rouse” him up swinging for home and it took O’Tauto fifty metres to get interested again. There’s no real zip in his technique, but he has a colossal stride at his top and he was fairly eating up the ground over the last hundred metres. He looked exactly the same three weeks earlier when second down the straight at Flemington, under Oliver. This was his first outing since last August, when he finished second over the Flemington 1400 metres with Damien Thornton up. He had the same rider when he won first up over 1200 metres at Cranbourne last July. Old timers have wondered if the gelding’s name was inspired by the deeds of 1971 Cox Plate winner Tauto - one of the hardiest horses to race in Victoria in the sixties and seventies. Not the case. His name is simply a combination of the names of his sire O’Lonhro and his dam Taut. O’Lonhro managed just nine race starts before an early retirement, notching three wins including the Group 2 Chelmsford Stakes, and finishing second to Trusting in a Warwick Stakes. O’Lonhro’s dam Mamzelle Pedrille is a lovely Zoffany mare whose wicked turn of foot brought her eleven wins and $569,000. She bagged a Group 2, and a couple of Group 3 races. It’s suddenly very significant, that Mamzelle Pedrille is a full sister to the grand dam of boom sire I Am Invincible. O’Lonhro was guided through his brief career by the Team Hawkes triumvirate, all of whom regarded him highly. The stallion stands at Larneuk Stud Euroa (Vic) at the bargain basement fee of $6600. His mare numbers were low for his first few seasons, but are steadily climbing as winners pop up everywhere - a total of 73 to date. Larneuk Stud proprietor Neville Murdoch races O’Tauto himself, having bred the horse from a Strategic mare called Taut. Neville made a wise decision in giving O’Tauto to Greg Eurell at Cranbourne - a trainer of immense grounding in general horsemanship. The Greg Eurell story is well documented, but worthy of revision. His talents in the show jumping ring were evident at a very early age. Early enough to see him competing in America and Europe with the Equestrian Federation team in his late teens. Greg was just twenty years old when selected in the Australian team to go to the Moscow Olympics in 1980. He shared the bitter disappointment of the entire squad, when the decision was made that the equestrian team would boycott the Olympics. A tiny contingent of 120 Australians competed in Moscow, as a protest against the 1979 Soviet occupation of Afghanistan. By the time Greg arrived home from the LA Olympics, he was ready for a change. He was a qualified plumber, but wasn’t keen to go back into the trade, and took the very brave decision to set up shop as a horse breaker. He operated from a forty acre property at Cranbourne, which had solid round yards and an adequate work track. When yearlings broken in by Greg Eurell started to appear at trackwork sessions, a trickle of patronage started to come his way. Within a year he was breaking yearlings for George Hanlon, Bart Cummings, John Hawkes, Lee Freedman and Geoff Murphy. “At certain times of the year we’d be breaking up to eighty horses at once”, recalled Greg. “We were working from 4am until dark every day. I was still in my twenties, and had energy to burn”. Greg was mixing a little horse training with his breaking work, which meant a few trips a week into the Cranbourne track. “I soon found out I couldn’t work horses there without a trainer’s licence and once I acquired my ticket I got keener and keener”, said the master horseman. I can remember calling the 1995 Surround Stakes at Warwick Farm as though it were yesterday. A Victorian filly called Princess D’or won comfortably in dazzling red and white striped colours, ridden by young Sydney jockey Aaron Kennedy, who’d been apprenticed to Bob Thomsen. The news buzzed around that the trainer was a young bloke from Cranbourne who’d been pretty handy on a show jumper, and could get a yearling going well. A steady flow of winners followed Princess D’or, with a few handy ones here and there, but nothing to command the attention of the public, the media or the owner ranks. When it happened, it happened in a big way. The first time Greg brought Apache Cat to the track, the uniquely marked horse raised plenty of eyebrows, and a few laughs. Greg merely quipped that he once had a skewbald show jumper who turned out to be a world champion. It wasn’t long before the wisecracks ceased and the racing world realised Greg Eurell had found the horse of his dreams. Born and reared at Chatswood Stud in Victoria, he was by the shuttle stallion Lion Cavern from the Whiskey Road mare Tennessee Blaze. His breeders Mr. P Radford and Ms R Lawrie later raced the gelding with GE and ST Riddell and MB and KJ Lofthouse. He was beautifully managed and skilfully trained by Greg Eurell throughout a magnificent career which yielded 43 starts for 19 wins and 11 placings. In this pre Winx era, his prize money tally of $4.53 million looked ever so impressive. His total of 8 Group 1 wins is testimony to the talents of a champion sprinter. “He had an unbelievable temperament, and worried about nothing”, recalled Greg over the weekend. “He could walk into a place he’d never seen before, and strut around like he owned the joint. He was a push button horse. He would do his work, go home, eat everything, drink plenty of water, and lay down for a sleep”. The only hiccup the trainer had with his flashy friend was a result of the dreaded equine virus which struck NSW and Queensland in 2007. Victoria missed the epidemic, but all horses had to be inoculated. The majority of horses had no reaction to the injection, but the “Cat” didn’t handle it. “I gave him a light gallop one morning and he sweated profusely, said Greg. “He never sweated and I knew it was a tell-tale sign. We took his blood straight to pathology and it showed a definite viral strain. Thankfully it didn’t affect him long term”. The loneliest few moments of Greg Eurell’s life came in Hong Kong at the end of 2009. He was slightly disappointed when Apache Cat finished out of a place only three lengths from the winner in the Gr 1 HK Sprint, but his disappointed turned to anguish when he saw Damien Oliver dismount from the champion sprinter. By the time Apache Cat got back to the gate, Greg was imagining the worst possible kind of breakdown. Connections were devastated to learn Apache Cat had sustained a small fracture to the base of a sesamoid bone. “It was bad enough, but at least we still had a horse and the vets gave us the OK to fly him home”, reflected Greg. His appearance alone would have sold him to the Australian racing public, but he had the talent to match. He’s probably the most photographed horse at Victoria’s famous Living Legends farm near Tullamarine airport, and will be an equine celebrity for the rest of his days. 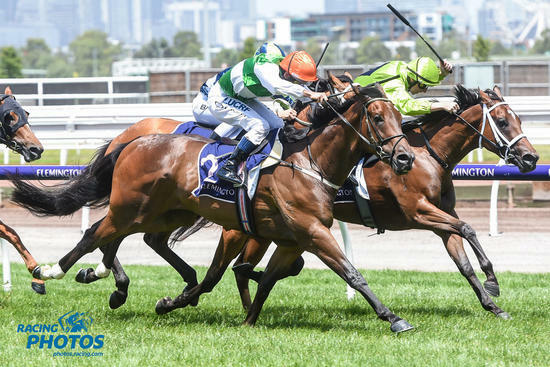 All of Apache Cat’s Group 1 wins provided magic moments for the Cranbourne trainer, but to lead in a Cox Plate winner is something else again. Greg walked that sacred ground in 2011, when the Reset mare Pinker Pinker, aided by a gun Craig Williams ride won the famous race. It’s not hard to imagine his disbelief a few months later when the bonny mare collapsed and died, just seconds after being given an intramuscular injection. Vets were of the opinion she had suffered an anaphylactic shock, after being injected with a commonly used joint lubricant. She was about to leave for Sydney, where she was expected to be one of the stars of the Autumn Carnival. “It’s a game of highs and lows”, said Greg. “You’ve just got to cop it”. Greg is delighted to be training a team of 60 horses out of the state of the art Cranbourne Training Centre. He and valued stable foreman Jim Mason have the use of an outside grass for industry and trial use, an inside grass, two sand tracks, a Pro-Ride track, hurdles and starting gates. The Training Centre has just opened a new 1000 metre grass, which will be for winter use only. It has a thick covering of turf, which should cope with winter traffic as horses prepare for the Spring Carnival. “I have to pay tribute to the Training Centre Committee”, says Greg. “They consulted with us thoroughly when the complex was being built, and they listen to whatever we have to say now. They have the interests at heart of the 250 horses that are trained here”. Apart from the support he gets from Jim Mason and a devoted staff, Greg is also fortunate to have the expert help of his wife Danielle Eurell. A former jockey, Danielle rides work six days a week from 5am to 8am, before heading off to her day job with the Melbourne Institute of Plastic Surgery. The trainer knows O’Tauto is no Apache Cat, but he sees a lot of upside in the lightly raced horse. “He’s getting better all the time, and is slowly working out where the winning post is”, said Greg. “I’m confident he’ll handle a mile and I’m hoping he’ll stretch out to 2000 metres. We’ll look at the Australian Guineas, and maybe the Randwick Guineas if he keeps improving”. Greg has had a tough few months coming to terms with the loss of his father and best mate Laurie Eurell, who passed away last October. Laurie had been a horseman in his early days, but devoted his later life to his thriving plumbing business in Sydney. He employed 80 people or more, for many years. “He would ring me every week to see where the horses were running, and what I thought of their prospects. I miss those phone calls”, said Greg. Laurie was quietly chuffed when his three grandsons followed him into the plumbing trade. Two of Greg’s boys Tim (33) and Nick (32) are running their own plumbing business, while Samuel (24) works for his brothers. There wouldn’t be a horse trainer alive who hasn’t regretted his lot in life, when things are going wrong and the winners have dried up. “Of course I’ve had moments when I wished I’d followed dad into the plumbing game, but those thoughts disappear pretty quickly”, said Greg this week. “I chose a life with horses and I wouldn’t change it. I can’t imagine my life without a horse like Apache Cat, or basking in the afterglow of a Cox Plate win. I’m glad I experienced the thrill of sailing over a giant six bar jump on old Johnny Mac. And come to think of it, how else would I have ever copped a gold watch from the Duke Of Edinburgh”.